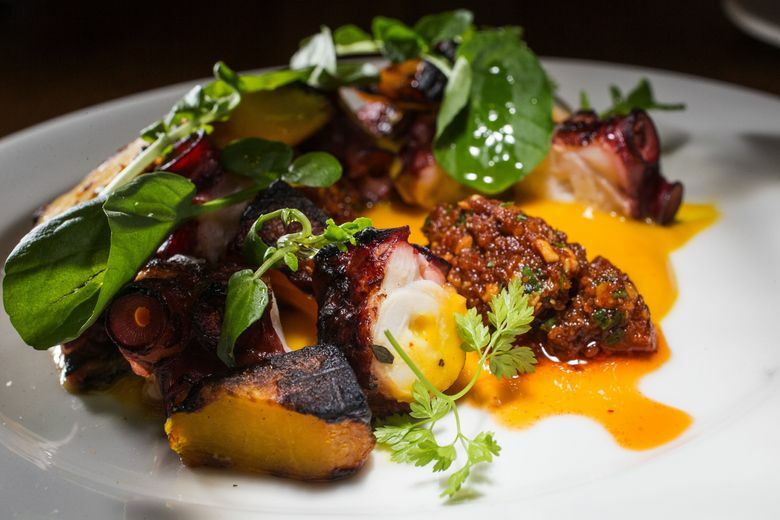 Critic Providence Cicero falls for Central District newcomer L’Oursin, a pretty space, impeccable food, “natural” wines and inventive cocktails. The relationship, if you can call it that after only a couple of dinner dates, began promisingly. It was lovely to step from a chill drizzle into L’Oursin’s caramel glow, to have an aproned server hasten to the door in welcome, to have plenty of hooks handy for wet coats. 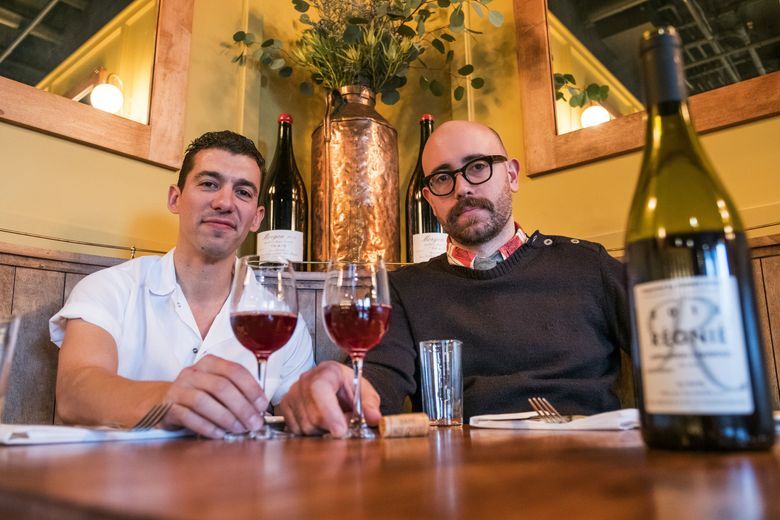 Zac Overman and JJ Proville’s 50-seat bar and restaurant in the Central District is such a pretty place, so French, with sunny-hued walls, honeyed wainscoting, curvy bistro chairs and mirrors all around. Not an Edison bulb in sight. Instead there are graceful globe wall sconces and a spiky fixture above the entrance modeled after the restaurant’s namesake, a sea urchin. In short order, an aromatic cocktail had me in its spell. The Mont Blanc is a pale but potent Gallic version of a Manhattan made with rye whiskey, the herbal liqueur Aveze Gentiane and the wine-based aperitif St. Raphael. 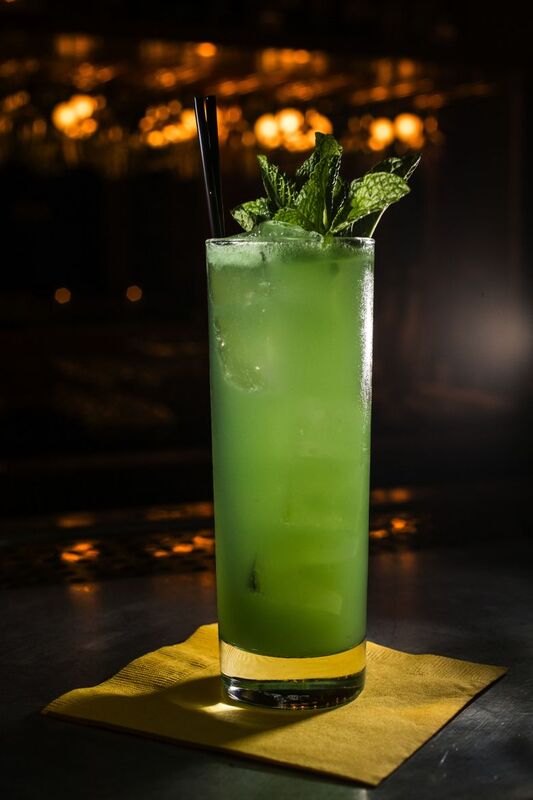 It’s among a dozen or so seasonally inspired drinks concocted by Overman, who previously was shaking and stirring things up at the Sitka & Spruce Bar. Fernandel (remember him?) is the name Overman gives to a winterized gin and tonic spiked with Byrrh and spiced with quatre épices. “Imagine an après-ski happy hour,” his menu précis says. Wine descriptions are even more allusive. “A natural beauty who doesn’t know she’s being raised by a pet rock and a can of pears.” That’s how wine director Kathryn Olson (late of Lower Bar Ferdinand) conveys the fruity minerality of a French sauvignon blanc. The natural wines pair extremely well with Proville’s style of cooking. He adheres to French classics without being at all fussy. As the restaurant’s name suggests, the bill of fare favors fruits de mer, though not to the exclusion of charcuterie like boudin noir (blood sausage) baked into brioche, or the cozy comfort of a well-cooked chicken. Bedded on potato mousseline, the bird’s breast is roasted, the hindquarter braised and the velvety brown sauce owes its nutty notes to vin jaune, a pungent, sherry-like yellow wine from the Jura region of France. Brandade de morue is pure comfort food, too — a gratin of cream and salt cod whipped with potato and baked to a golden brown. I only wished for some toasted baguette slices with it. Paté en croute is a dense, savory loaf of pork and foie gras forcemeat, capped with a flavorful gelée and wrapped in a golden, egg-enriched pastry. Cumberland sauce pools next to it. Popularized by Escoffier as a companion to cold meat, the sauce here features whole currants in a peppercorn-suffused reduction of chicken stock, Madeira and sherry. Fish soup also comes en croute. Poke that lofty puff-pastry dome and dip a spoon into rich stock distilled from fish bones and spot prawn shells; mussels, clams and rockfish lurk in its saffron-scented depths. Crab beurre blanc comes in the same footed bowl, a chalice fit for this nectar of the gods. The beautifully structured butter sauce is generously endowed with Dungeness as sweet as the Petrale sole it’s meant to adorn. 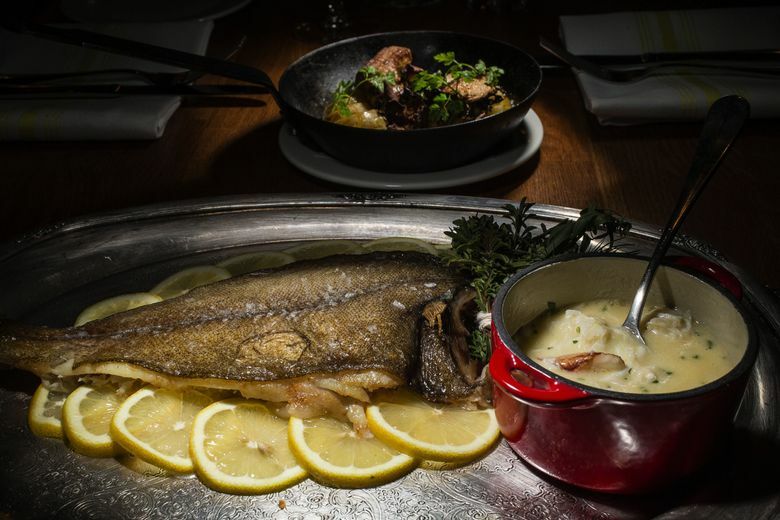 The fish, roasted whole with lemon and herbs, lies resplendent on a silver platter that also holds a cast-iron skillet of sautéed black trumpet mushrooms and fennel. Proville cooks fish simply but accessorizes it extravagantly. He swaddles roasted lingcod in salty, slightly crisp prosciutto-like French ham and nestles the package among flageolet beans cooked to creaminess in a ham hock broth. A briny sea urchin sauce dotted with salmon roe drapes poached arctic char. The skin, pressed and roasted separately, is transformed into a crackling wafer of fat, oil and salt. Radish, parsnips, salsify and sunchokes are among the winter vegetables that partner with the fish. A plate of roasted squash goes from frumpy wall-flower to Cinderella at the ball, dressed in a piquant green peppercorn sauce, dancing with black trumpet mushrooms, peppery greens and frilly chervil in what amounts to a warm salad. My fling with L’Oursin began with a plateau de charcuterie de poisson: a wooded board arrayed with smoked fish (rosy steelhead and sable edged with sweet paprika), herring terrine, lemony seaweed butter, pickled radish and fresh boursin cheese for spreading on house-baked whole-grain rye bread, dense with seeds and nuts. By dessert, seduction was a fait accompli. Pace yourself for exquisite Calvados cake with crème fraîche ice cream and apple slices, raw and poached; for a milk chocolate mousse crunchy with hazelnuts and feuilletine; or for vacherin glacé, vibrant layers of lemon-thyme meringue, lemon ice cream and huckleberry sorbet. Proville is the French connection. L.A. born, he spent his teenage years in the Haute Savoie countryside of France and holds dual citizenship. Overman hails from North Carolina. Their lives intersected in New York City about a decade ago when both worked at StarChefs.com and lived in the same Brooklyn neighborhood, Red Hook. Overman, a graphic designer by day, tended bar at night, eventually managing Fort Defiance, a top Brooklyn cocktail bar. Proville worked there, too, after switching from food writing to cooking. After Hurricane Sandy devastated most of Red Hook, both men ended up in Seattle, where Proville cooked for three-plus years with Mike Easton at Il Corvo. For years they plotted the restaurant they would open together someday. It was going to be in Brooklyn, but I’m very glad they ended up here.